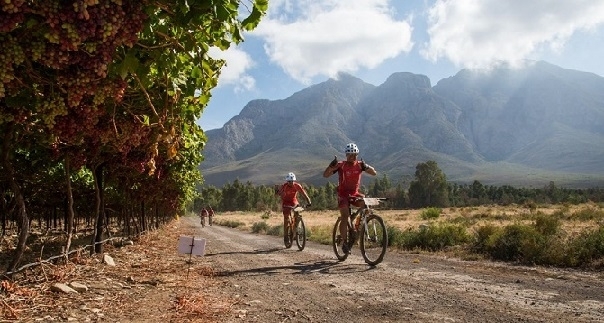 The trails at Meerendal Wine Farm are fairly easy beautiful singletrack riding, and the flat landscape makes them perfect for those in search of some endurance training, too! 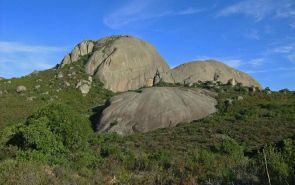 Start at the wine farm buildings along a track meandering gently uphill before it descends onto the first stretch of singletrack down the ‘Mineshaft’ and across a small plateau. Then climb the zigzag ‘Stairway to Heaven’, while having great fun attempt­ing to stay on the concrete slabs. The climb is short and not too brutal; after cresting, continue along the flat for a fur­ther 150m, then follow the Blue arrows to your left and ride up Dorstberg. This is an average climb with some sharp turns. At the top, you can expect some serious fun. The trail is beautifully carved, with berms and small jumps down the side of Dorstberg. Halfway down you have three route choices around a big rock drop-off and then continue on the singletrack until you find yourself back at the top of ‘Stairway to Heaven’. 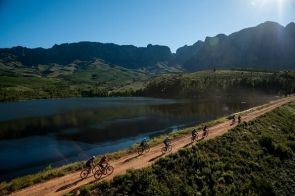 Keeping straight at the bottom of Dorst­berg the singletrack is flat and even, requiring constant pedalling to keep momentum. Follow the signs and trail around the vineyards for another 3km, until you come to a fast downhill jeep track before you enter the last singletrack of the Gum Tree Loop. Exit the Gum Tree Loop and turn left into a series of bends through fields and vineyards. Cross a small wooden bridge, and ride around the scenic farm dam, over another wooden bridge and eventu­ally back into the parking area.